Congrats! 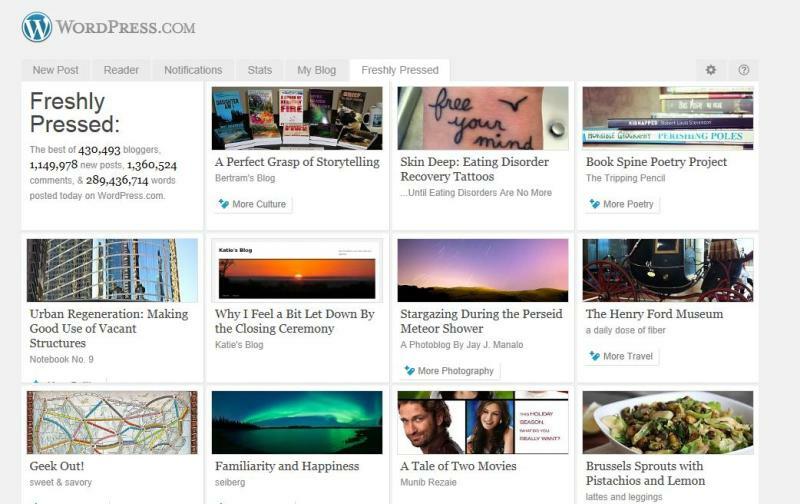 We’ve picked your post ( https://ptbertram.wordpress.com/2012/08/13/a-perfect-grasp-of-storytelling/ ) to appear on Freshly Pressed on the WordPress home page. We really enjoyed your well-written, sharp, and succinct take on perfect characters, unbalanced worlds, and good storytelling in general, and we know the rest of the WordPress community will too. Your post will appear on the site in the next day or two, so get ready to welcome your new readers. Once your post goes live, shout it from the rooftops! Tell your family, friends, and readers to check out the WordPress home page, and share the good news with your social networks (we’ll do the same). Most importantly, keep up the great work. To boost your blogging prowess even more, check out “So You Want To Be Freshly Pressed” ( http://en.support.wordpress.com/freshly-pressed/ ) for tips on everything from enhancing your theme to becoming a grammar guru, and visit The Daily Post ( http://dailypost.wordpress.com/ ) for pro tips, blogging challenges and more. The post appeared on Tuesday evening. This was the third time I’ve been Freshly Pressed. The other two articles that made the WordPress front page were I Am a Three-Month Grief Survivor and I Am a Six-Month Grief Survivor. I’ve always aimed for typo-free text and eye-catching headlines, but I don’t always have a strong point of view. (I don’t much like contention.) Apparently, though, I’ve managed to strike the right chord with the WordPress editors three times, and you can, too. Just keep blogging. If you write it, they will come. Thanks for sharing that, Pat. Although I just switched to Word press I, too, will attempt to be “pressed” now that I know there is hope! And that is how I found you so definitely a worthwhile pursuit! If nothing else, following the tips in the article will improve your blogging asfollowing the tips did mine. Best of luck with your WordPress Blog. Three?! You’re so lucky; I’m still trying to get my first. How long did you have to wait before your blog was Freshly Pressed? I started blogging on September 24, 2007, and three years and three days later I was Freshly Pressed — I know why, too. That blog screamed out my grief at the loss of my life mate/soul mate, and the honesty is what caught people’s attention. Three months later, they pressed another grief blog. Not sure why this one caught their attention, except that it is a different point of view. jeez, it’s not easy to get Freshly Pressed, is it? Oh, and sorry for your loss. Considering that there are more than a million new posts on WordPress every day, the odds of getting Freshly Pressed are not great. I truly don’t know why I got picked three times. I do know the process starts with well-written posts that add a different perspective, but after that, the main thing is good tags. Without good tags — not too general, not too limited — the editors will never find you. And neither will search engines. looks like i may need more creative tags, then. Wow, that is too kewl. Congrats, Pat. It was very cool!! Now if it had only resulted in book sales . . .
Had to laugh. Have gotten good press for my new book in national magazines and even USA Today Weekend this past weekend. Only hoping someone not only read the article, but then actually bought the book! Wow! Wouldn’t that be great! Hello? Anybody out there?! Just catching up on my blog reading (my husband had been in the hospital twice in the last two weeks, so I missed this when it came out). Congratulations!!! I’m sorry to hear about your husband, Rebecca. I hope he’s getting better now.